Furnish your kitchen in style with the all important kitchen must haves. Spanning from Solid Oak Wine racks with added storage, plate racks, ash and shabby chic wall racks. These kitchen racks add style to any space they are added to, giving the atmosphere of elegance, sophistication, and taste. 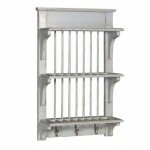 With function and beauty you can’t go wrong with these Kitchen racks.